Last night the sky was clear with no cloud coverages. My friend and I drove to a farm near Pickering and did some star gazing. I brought my camera gears along to do some simple astrophotography. First easy target for the camera is the moon. 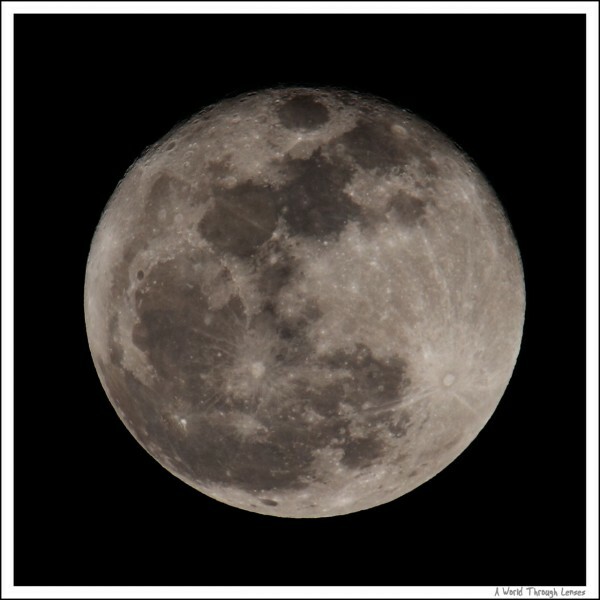 I’ve posted my photo of the first full moon of year 2010 before. Beautiful as the full moon is, it is actually too bright and does not have enough contrast on the moon surface to see some of the craters. A new moon will actually offer much better details than a full moon because of the contrast provided by the shadows on the moon’s surface. Last night is 2 day past moon’s first quarter, the moon is actually about 57% full. However it still offered enough shadows on the moon’s surface so that some more details can be seen. The same gear as the last moon shot was used. Canon EOS 7D was coupled with Sigma 100-300 F4 & Sigma 1.4x teleconverter all sitting on the Manfrotto 055 Pro tripod. This gives me a relative stable platform for the camera and an equivalent focal length of 672mm. The following photo was shot at ISO 100, F11 @ 1/100th second. Today is the first full moon of 2010. 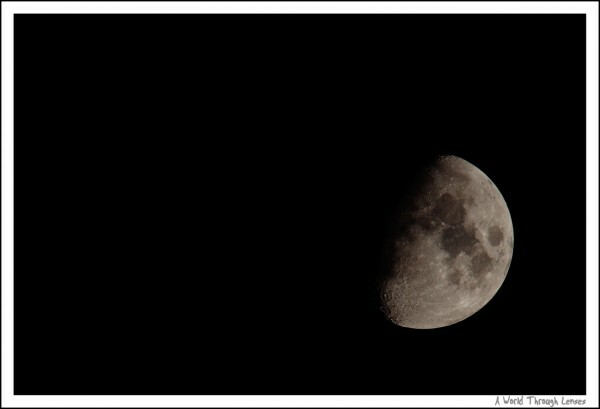 That large beautiful moon up on sky is calling out to me to try out my Canon 7D DSLR on it. So despite the -15°C (with wind chill -20°C) weather, I geared up and went to my backyard for a bit of backyard astronomy. Okay so it is not the ideal place to do any astrophotographing since I live right in the city. The large amount of light pollution from city lights and the air distortion in the city are all enemies of astronomy. But in such cold weather, I really don’t want to drive up north just for a few photo of the moon. Not to mention, just as the title suggests, I don’t actually own a telescope. I was merely trying to see how much my Canon EOS 7D can capture when combined with my long lenses. I have a Sigma 100-300 F4 and a Sigma 1.4x teleconverter. The Sigma 100-300 F4 @ 300mm coupled with the Sigma 1.4x teleconverter gives me a focal length of 420mm. On the 1.6x Canon EOS 7D it gives me an effective 672mm focal length. I started with my daily tripod / head combo, the Gitzo GT1541 Mountaineer carbon fiber tripod and Markins Q-Ball Q3 Emille. Now that’s one big mistake. The little 4 section light Gitzo tripod is obviously not stable enough to photograph something that’s some 380,000 kilometers away, which is how far the moon is away from the earth. And the Markins Q-Ball even though stable enough to shoot earthly things but definitely slips a bit when having the big lens aimed upwards. So even with mirror locked up, and remote release cable, the image is still very blurry. Here’s the result, click on the image to see in full resolution. Canon 7D, Sigma 100-300 F4 @ 300mm, Sigam 1.4x teleconverter, manual exposure @ ISO 100, F8, 1/100 sec, manual focus using live view. It’s a bit late for fall colours in where I live. But came across this tree in East Point Park that still got the full set of leafs in brilliant fall colour. With the sun shining on the top, you feel like watching a magic light show when lying under the tree and looking up into the canopy. Had a short outing in the Muskoka region in the fall. Had some very brief time to photograph to a few fall landscape shots. I was with another friend, we set out at around 4:30am and drive into Algonquin provincial park. We arrived at the Lake Of Two Rivers campground trying to shoot the run rise. The color that day was wonderful. A thick fog developed on the lake and the rising sun produced a smooth gradient of warming color in the air. The subtle reflection of the island in the water, and a few shadow of the distant mountain, all made that morning very memorable. Here’s a shot to show you the color of the morning.